We have a battery for everyone who enjoys being in the great outdoors. Whether you are camping on the beach and need to charge your smart devices, or on the road in your caravan and need to power your off-grid lifestyle and hungry AC appliances. Powering freedom with lithium batteries is possible, like never before! 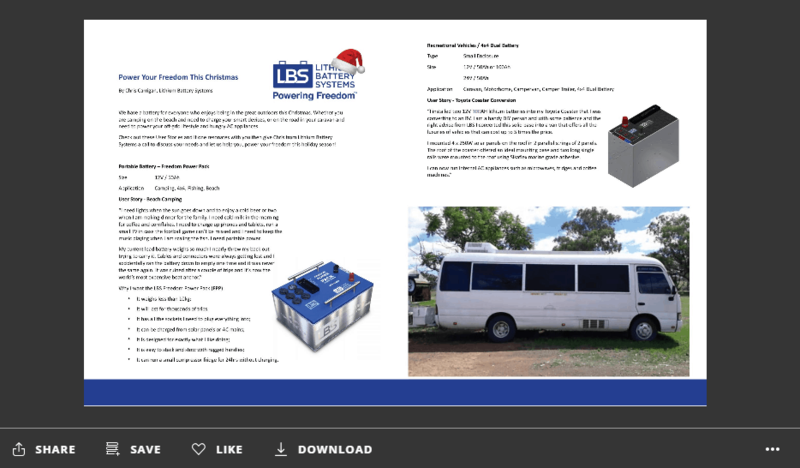 Check out these User Stories and if one resonates with you then give Chris from Lithium Battery Systems a call to discuss your needs and let us help you, power your freedom this holiday season! “I need lights when the sun goes down and to enjoy a cold beer or two when I am making dinner for the family. I need cold milk in the morning for coffee and cornflakes. I need to charge up phones and tablets, run a small TV in case the football game can’t be missed and I need to keep the music playing when I am scaling the fish. I need portable power. It can run a small compressor fridge for 24hrs without charging. 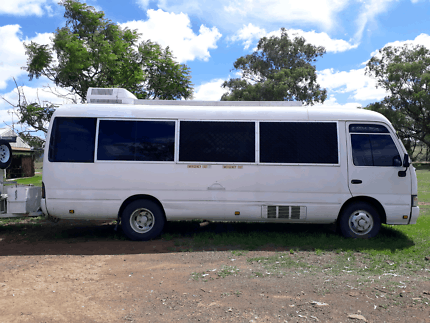 “I installed two 12V 200AH lithium batteries into my Toyota Coaster that I was converting to an RV. I am a handy DIY person and with some patience and the right advice from LBS I converted this solid base into a van that offers all the luxuries of vehicles that can cost up to 5 times the price. In the world of yacht racing, weight is everything. By stripping the weight of a man (~75kg) permanently from the vessel made the boat faster, simple as that. The challenge was to integrate the two batteries into the vessel as a working system and ensure everything worked as before and also incorporate a new electric sheet winch into the design. The current 25kg lead based start battery was replaced with a lightweight LBS 12V Start Battery which weighed under 8kg but still packed ample punch to start both engines. 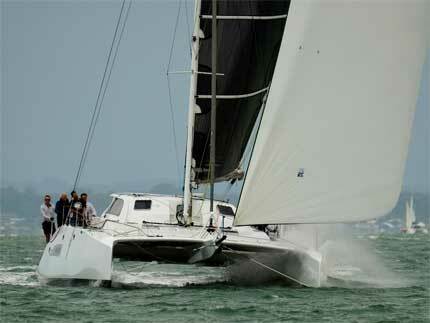 The catamaran had 4 permanently fixed solar panels and the current Victron Solar controllers were left in place. A new electric sheet winch that draws up to 100A under load was part of the upgrade. The power to this new winch and was supplied by the new lithium house battery. 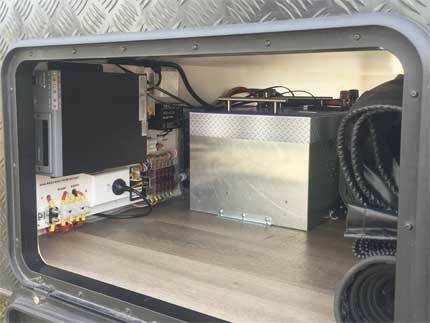 The remote monitoring screen was mounted in the main cabin to provide a simple fuel gauge of the battery storage and other information including time to empty or time to full. This is what we mean by Powering Freedom, reducing weight and adding more usable power so you can go further and longer. “My 4×4 is kitted to the max. My fridge is mounted on rails and custom installed. I have an accessory drawer with an air pump, a spotlight, winch and jumper cables to help the less prepared. I need to know I can power everything and never have to worry about my main battery being drained.